Mrs. Doris Maechtle, of the Town of Port Washington, passed away Friday afternoon, November 18, 2016, at Lawlis Family Hospice Center in Mequon. She was 89 years old. Doris was born on December 15, 1926 in the Town of Herman, daughter of Arthur and Esther Wehrmann Gosse. On June 1, 1946 she was united in marriage with Harvey Maechtle at Grand Ave. United Methodist Church in Port Washington. The couple settled on a farm in the Town of Port Washington and started their family. Harvey preceded her in death in 1994. Doris worked on the family farm and also at River Road Cheese Factory for many years. 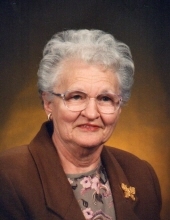 Mrs. Maechtle was a long-time member of the Grand Ave. United Methodist Church. She enjoyed gardening and canning. She also liked to travel, and with her sisters-in-law had visited France, Germany, Switzerland, Alaska and Hawaii. In her later years she enjoyed bus “adventure tours” with her friends. Most importantly, Doris loved spending time with her grandchildren and great-grandchildren. Mrs. Maechtle is survived by her five sons: Larry Maechtle, Paul (Donna) Maechtle, both of the Town of Port Washington, David (Wendy) Maechtle of Columbia Falls, MT, Mark (Janet) Maechtle of the Town of Port Washington and Wayne Maechtle of Port Washington. She is further survived by 6 grandchildren: Jerod (Dana) Maechtle, Sarah (Tony) Milazzo, Michelle (Matt) Furlott, James Maechtle, Amanda (Jerry) Landis and Michael (Diamond Hatch) Maechtle, 9 great-grandchildren, sister Caroline (Kenneth) Greger of Sheboygan, nieces, nephews, other relatives and friends. She is preceded in death by her husband Harvey, brother Marvin (the late Marilyn) Gosse, and sisters-in-law Helen Maechtle and Janet (the late Albert) Laubenstein. Funeral Service will be held at 11 AM on Wednesday, November 23rd, at Grand Ave. United Methodist Church, 505 W. Grand Ave., Port Washington. Pastor Don Drollinger will preside. She will be laid to rest beside her husband in Siemers Union Cemetery, Howards Grove, later that day. The family will receive visitors at the CHURCH on Wednesday from 9-11AM. The Eernisse Funeral Home in Port Washington is assisting the family with arrangements. Online condolences may be left at www.eernissefuneralhome.com . To send flowers or a remembrance gift to the family of Doris M. Maechtle, please visit our Tribute Store. "Email Address" would like to share the life celebration of Doris M. Maechtle. Click on the "link" to go to share a favorite memory or leave a condolence message for the family.